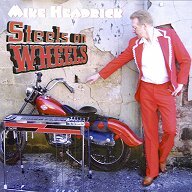 Mike Headrick, with his wife Teri, owns and operates Country Discovery Records, Mikron Recording, and Sand Mountain Music . Mike produces all the records on the Country Discovery label and plays pedal steel and various other instruments on most of them. Earlier in his career, he backed many of the country stars of the day. In 1976 he returned to his home community of South Pittsburg, Tennessee and established Tunesmith Music and Mikron Recording. 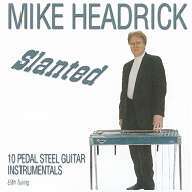 In recent years, Mike has produced an astonishing selection of excellent pedal steel instrumental CDs, which we are pleased to include in this catalog. 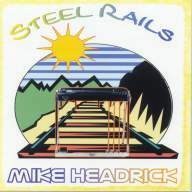 Subtitled "10 Pedal Steel Guitar Instrumentals, E9th Tuning", this project features Mike Headrick playing his own country tunes on an Emmons SD-10. The production features classic country instrumentation with guitars, piano, bass, drums and twin fiddles. The steel is up front throughout. Mike's playing is flawless and his love for real country music really shows through. More of Mike's fine country playing. This CD is a bit more advanced than "Slanted", though it is still all E9th. It also includes great new arrangements of "America the Beautiful" and "The Star Spangled Banner". 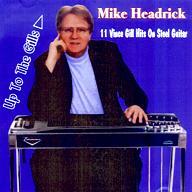 Mike and his band tackle 11 of Vince Gill's hits as steel guitar instrumentals. I like Vince, of course, but it's a real treat to hear these songs rendered with pedal steel as the lead voice. Mike is a fantastic player, and steel guitar legend John Hughey even sits on a few tunes for real pedal steel extravaganza. If you're like me, you probably think that the only thing wrong with The Flying Burrito Brothers was that there wasn't enough pedal steel. Well, Mike Headrick has finally fixed that. Here's a whole CD of Hillman/Parsons tunes done as instrumentals. Mike mixes the sound of his modern Zumsteel with the more authentic Fender 800 to keep the flavor of the original recordings. The backup band and production quality, like Mike's steel playing, is as good as I've ever heard. Put this in your car and drive it. This CD contains steel guitar versions of 12 of the most beautiful melodies Merle Haggard ever recorded. Mike felt the tribute would not be complete without an appearance of Ralph Mooney, who was a tremendous early influence on him. Ralph traded solos with Mike on three of the songs (marked with * below). On other tracks, Mike plays intos, fills, and turnarounds in the Mooney style on a vintage Fender steel, while playing the main melody lines on Zum and Emmons steels. 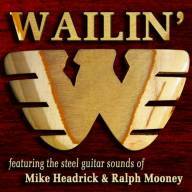 12 great Waylon Jennings songs played by Mike Headrick and the legendary Ralph Mooney. If you're a Waylon fan or even a steel guitar fan, you must know that Ralph was Waylon's steel player for a decade and a half, and played on Waylon's recordings. These songs are filled with Ralph Monney's style, even when Ralph is not playing. Mike plays Emmons and Zum in his own style, and also plays a Vintage Fender steel in Ralph's style on most of the songs. Sometimes you will hear Ralph play a phrase and then Mike will answer with a phrase played much like Moon would have played it in the 1960's. Fun, Fun, Fun!